BEST general purpose I.S. Battle Armor around the FedCom Civil war era? Re: BEST general purpose I.S. Battle Armor around the FedCom Civil war era? On the contrary, the Longinus has extra firepower. Yes, you're limited to moving one MP unless you fire or eject it, but you do have an option for extra firepower with the suit. If you cannot make use of it, you still got a suit that is equivalent to other general purpose combat suits (no LRR but David Gauss has a bit more range so it sorta balances out), if you can make use of the SRM, you have a superior suit. Other GP suits do not have this option, and thus aren't quite as good. EDIT Personally i don't regard "GP" here as meaning solo combatant but just denoting a suit that isn't really specialized. Naturally BA work in conjunction with other units. 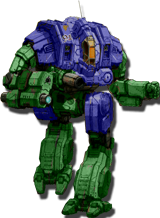 I consider the Infiltrator MK II general purpose. It doesn't have the firepower of the Longinus or the armor. But it has stealth armor and if you aren't hit all that often, that pays for itself. The Magshot reaches out to 9 hexes at all times. Its why I said IS Std or clone w/o transport, Longinus w/ transport . . .
Its also why I wish we had a Longinus that duplicated the Asura- give it some RLs which can reach farther.